Growing up near Buffalo, NY, and being a musician and budding jazz fan, I of course stumbled upon Jazz FM 91, out of Toronto. The local NPR station did (and still does) have jazz on at certain times, but the Canadian station had music on almost constantly. There was the occasional BBC news break, and there were morning shows and other programs with on-air personalities you would get to know, but you could almost always tune in and get music. The music mix on this station is interesting. They of course play what you’d expect, including the likes of Miles Davis and John Coltrane, and other artists throughout the history of jazz. There was also a fair helping of newer music, both from established artists as well as up-and-comers. And of course, they played a fair amount of Canadian jazz, including musicians based out of Toronto area. In fact, being a local station to that area and including so much of the associated goings-on, just by listening I actually felt closer to that fair city. Over the years I had traveled there to visit on different occasions, but thanks to their local jazz station I actually started to feel like I knew it on another level. The 2000s saw me based around the Buffalo area in some capacity, high school for the first half, then back now and then from college in Rochester. I tuned to the station when I could, primarily over the air when in range but over the Internet when away. My listening waned some due in part to Rochester having a great jazz station itself, but it didn’t stop completely. Sometime in the later part of that decade I stumbled upon Stolen Moments, a show on Friday nights from 10 PM to 1 AM. It consisted of three hours of music (in half-hour sets) selected by the host, David Basskin, and began and ended with Oliver Nelson’s Stolen Moments, its theme and namesake. I don’t remember when it was that I first discovered this show, but I found myself making an effort to seek it out each week. I wouldn’t say I never missed one, but I almost always made an effort to tune in. The premise of the show was to play what might be considered lesser-known or obscure tracks, maybe not necessarily outside the mainstream of jazz, but certainly ones more within the domain of someone approaching jazz buff status. Listening was a useful way to discover new artists; for instance, I first heard Hampton Hawes through this program. Often times David would play a track that was previously unreleased, or that had been released decades ago but faded into obscurity. Sometimes he had a piece with unusual instrumentation, and once in a while he’d even play a classical piece. This isn’t to say that the whole show consisted of music never heard before. In fact, artists such as Oscar Peterson, Chick Corea, and Pat Metheny came up frequently, as did Joey DeFrancesco. David would even play Steely Dan now and then, being a self-professed fan. It was this mixture that kept me listening – the show was curated. You could discover new music by listening to it, yet in a familiar setting. You got to know the host, and you knew that by listening there was a good chance you’d come upon something you liked. This past Friday, June 15th, I tuned in as I usually did. This time, I caught the first part in my car on my way back to Buffalo for Father’s Day weekend. I didn’t catch the beginning of the show, but listened for an hour or so. At home, I caught the final hour online. To my surprise, David announced that this was in fact the last time that the show would air, before signing off by letting the theme play in its entirety. I was a little shocked. I checked the station’s website, only to find that the block had been changed to a normal music block in the schedule. I poked around some more and found out that the station had apparently been going through some trouble, and had let several of its hosts go, including David Basskin. I can’t really speak for what happened over there, but I am sad to see this show go off the air. I can still point Rhythmbox to their stream and hear a lot of great music, but I could get this through one of the popular streaming services, or I could just put together a playlist from my own music collection. It’s even worth searching Youtube now and then. But the show itself gave me a personal connection, one that I will miss. Of course, it had to come to an end, and again, the station is still there. And the truth is, there are other stations out there, and other interesting shows – I hadn’t really bothered looking for an alternate. Not because I thought I’d never need one, just because it hadn’t occurred to me to listen for one. I suppose I’ll start looking, but Friday nights will never be the same. I recently started setting up Kerberos and LDAP for my home network. While I don’t have a ton of users, it’s handy to be able to centralize account information and do single sign-on. So far all I really have for clients are a server computer, laptop, and Raspberry Pi, but I find it quite handy even if it was kind of a pain to set up. I have an older PC in the basement I use mostly when I need to work on the network or some other project and just need to quickly grab a web page or SSH into something. 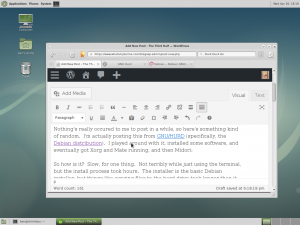 I had been running Ubuntu Mate on this, since I like the Mate desktop and wanted to give this distro a try. It ran, but not well. The desktop was slow, and it would take a minute to start something like Firefox. This machine is 3 GHz Pentium 4 dual core with 1 GB of RAM. I also use OpenBSD on and off, and like it a lot. Since I was curious about how it does on the desktop I decided to give it a try, using the Lumina desktop environment. It works well, and it feels noticeably faster than Ubuntu did on this hardware. Initially I got it going just to get a quick desktop, but then I started thinking about getting it into my Kerberos realm. 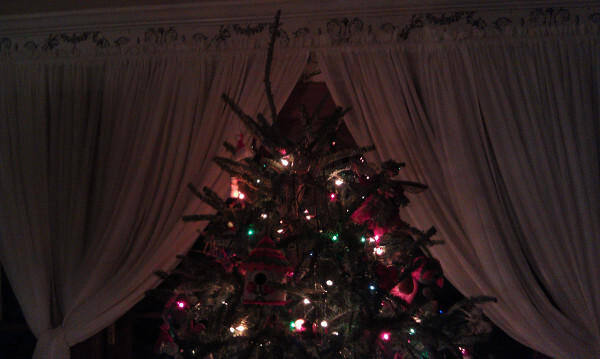 This turned out to be a little tricky. For one thing, OpenBSD uses Heimdal Kerberos, as opposed to MIT Kerberos, which the rest of my setup uses. For another, doesn’t use PAM, like all (most?) GNU/Linux distros do, as well as FreeBSD. RedHat’s SSSD is also not present, which has been a godsend on the other platforms. OpenBSD can authenticate to sources such as Kerberos and LDAP, however, though there isn’t a whole lot floating around online about it (though of course the man pages help out a lot). There’s also no support for authorization (eg, group information, UID number) for anything besides local files and NIS, which presents a further challenge. I thought I’d post this here in cases it helps someone down the line, or in case I have to do this again myself. 🙂 I’ve pieced this together from information found online, as well as man pages. Note that this doesn’t cover setting up the Kerberos/LDAP server(s), which is another topic on which there are other guides. I used a combination of this guide for Debian, and this one for Ubuntu (even though my KDC runs Debian). At the moment the exact details of the setup aren’t terribly important, but you should have some kind of Kerberos/LDAP implementation that authenticates users. I just want to point out here, that although Active Directory is in fact one Kerberos/LDAP implementation, I don’t really have much experience with it, and this guide will not directly concern it or any peculiarities it may have. In theory a lot of what you see here should be applicable, and hopefully it will be helpful. In my travels I found this, which may be helpful if that’s what you’re trying to do. Aside from the server, you should obviously have an OpenBSD system you want to have as your authentication/authorization client. Have some test users kicking around helps too, both some local users on your OpenBSD system as well as a couple configured in Kerberos/LDAP to test authentication there. I’m using OpenBSD 6.2, i386, but I think this should work on other platforms as well(? ), particularly amd64. Now a word of caution: this guide requires modifying some system files. I myself screwed up at one point, causing my system to boot but not allow anyone to log in. I recommend not only making backups of relevant files, but also reading a bit about single user mode. Take a look at the root password reset guide in the OpenBSD handbook; you can also use single user mode to fix system files. For running an editor, you may also want to take a look at this if you get any errors in single user mode. First, we’ll install Kerberos, which will handle authentication. That is, this will check a user’s password and verify they are who they say they are. I assume that you have a realm, EXAMPLE.COM, with a KDC/admin server kerberos.example.com. Note that in this guide, in a code snippet meant to be run at the command line, # indicates the root prompt. However, in a file, # will indicate a comment. # See krb5.conf(5) and the heimdal info(1) page for more information. By this point you should be able to use tools like kinit, klist, etc. on the OpenBSD client. What we want to do now is set up a host principal for this machine, and a keytab for it. At this point, I would like to mention that I had a problem with this on OpenBSD: normally I create the principal by logging into my KDC, then creating the principal in kadmin, then logging into the client and running kadmin as root. Because of the krb5.conf configuration, you basically use kadmin to copy the principal from the KDC to the local keytab. Unfortunately, when I tried to do this from my OpenBSD machine it hung. I’m not sure what was going on, or if it was some kind of Heimdal vs MIT Kerberos issue, but I ended up having to copy the keytab over manually. Log in to your KDC, and run the following. Note that in the addprinc command I have the -x dn=”uid..” line – this is because my KDC uses LDAP as its backend (not just for authorization), and I keep the principal with other information about that computer. (See the Ubuntu guide I linked earlier for more information.) You can leave that out if you don’t do this. Authenticating as principal kerberosadminuser with password. Next, we want to be able get that principal when we log in. Earlier, we installed login_krb5, which will do this (along with of course letting us log into the system without a passwd entry). The line to add is “:auth=-krb5-or-pwd:\” just above “:tc=auth-defaults:\”. This line allows you to use Kerberos as a login mechanism, but falls back to checking local files if that fails. Assuming you got the Kerberos part working, now might be a good time to take a break, get a fresh coffee, etc. As I mentioned before, LDAP is used for authorization, that is user info like groups, login shells, etc. Unfortunately, OpenBSD doesn’t actually support using LDAP for authorization, only Network Information System (NIS, aka YellowPages or yp, which most of the tools are named for). Luckily, there’s a translator we can use that comes with the base system, ypldap. This basically makes the LDAP directory look like a YP (NIS) server. I couldn’t find much online about using this with OpenBSD 6.2, but I think I got it working. I found two pages on this, both of which are older. Both of these start by talking about login_ldap, which I ended up installing, but which isn’t really needed. That’s if you want to authenticate to LDAP (ie, if that’s where you’re storing your passwords). In our case, that’s already taken care of by login_krb5. There is another caveat – on my Linux clients, I use GSSAPI with the host principal to authenticate to the LDAP database. On OpenBSD, ypldap does not support this (that I could tell). This means you’ll need a user that can just bind to LDAP by itself, for instance using the userPassword attribute. This user needs to be able to read through your directory to get user/group information. Also, while I don’t have it set up here, you should probably be using SSL/TLS with your LDAP server. attribute name maps to "uid"
attribute uid maps to "uidNumber"
attribute gid maps to "gidNumber"
attribute gecos maps to "cn"
attribute home maps to "homeDirectory"
attribute shell maps to "loginShell"
attribute groupname maps to "cn"
attribute groupgid maps to "gidNumber"
list groupmembers maps to "memberUid"
In some of the other guides online, it was said that you had to edit /etc/rc.local to make sure that ypldap starts before ypbind. For 6.2, I didn’t have to do this. I like OpenBSD a lot, but this was kind of a pain. Actually, it was a good learning experience, and it’s good to know that it’s possible. I got to learn a little more about the internals, and once I started looking into it it wasn’t too bad, just different from what I’d been used to on Linux. Let me know if you have any trouble with this, or if I missed anything (I’m putting this down partly from memory, after working on it on and off over a couple weeks.). I did not manage to get Kerberized SSH working, that is being able to SSH to/from the OpenBSD client without entering a password. I think this is because the builtin sshd doesn’t support it. This might be something that could be changed by recompiling it, I’ll have to look into it in the future. Author BenPosted on October 31, 2017 Categories UncategorizedTags Halloween 2017Leave a comment on Happy Halloween 2017! Even Midori was kind of sluggish, but it was usable until it crashed. So how is it? Slow, for one thing. Not terribly while just using the terminal, but the install process took hours. The installer is the basic Debian installer, but things like copying files to the hard drive took longer than it seems like they would under GNU/Linux. The same is true of just installing packages. The desktop is of course noticeably sluggish as well, although using something like Openbox might improve things here. This machine is an old Dell Optiplex, with a 1.6 GHz P4 and 2 GB of RAM (only 768 MB were picked up according to htop). The graphics are Intel, which I think requires a kernel module on Linux, which of course isn’t supported here. This probably explains the X slowness, but otherwise while this machine is old it’s felt faster on other OSes. As far as applications, there are quite a few Debian packages ported over, and while not everything works very smoothly (I tried getting Apache and PHP going, only to have mod-php give an error about allocating shared memory) a lot of familiar programs are available and do run. I dare say that there’s enough here to run an almost-functional desktop, although there is no sound or USB support (although keyboards/mice may work due to BIOS emulation). Author BenPosted on April 26, 2017 April 26, 2017 Categories Technology/InternetTags Debian, GNU, Hurd, Mate, Midori, OSLeave a comment on Posting from Hurd! Easytether is a nice application you can use to tether your Android phone regardless of restrictions put in place by your carrier. It consists of an app for the phone, as well as a program you run on your computer. The two then talk to each other using the phone’s USB debugging abilities (ie, through ADB, which is integrated). On the computer-side, Linux, Windows, and OS X are supported, and you can even use it with a Raspberry Pi. That works fine, but it’s kind of a pain. Networkmanager is fairly capable these days, and it would be nice to make it do some of this for us again. The reason it doesn’t is that, with the current version (1.2.0-0ubuntu0.16.04.2 on this machine), virtual interfaces that it didn’t create itself are ignored by default. Luckily, there is a way we can make a new connection and automate things. Unfortunately, this doesn’t seem to be possible with the panel applet in Xubuntu, but we can do it from the command line using nmcli. Basically, that script is triggered by the pre-up and down actions, and starts and kills easytether-usb for us. The symlink was necessary because Networkmanager needs anything that acts on this to be in the pre-up.d directory. Now, you plug in your phone, then use the nmcli commands from above to bring the interface up and down, and that’s it! One caveat: You need to be able to use USB debugging on your phone. Also, you may have to confirm on your phone that you want to be able to connect from your PC or laptop first. I also find that I have to mount my phone (IE, click on the icon on the desktop and browse to it in the file manager) before easytether-usb will connect. Make sure you get Easytether working manually like at the beginning of this post, and you should be fine. Have fun! I use ownCloud on a few of my machines for keeping some folders synced via the desktop syncing client. I’m fairly happy with it, at least for smaller files like documents and pictures. (Part of this is because I’m running the server on a Raspberry Pi, which is a little slow, but for my purposes works fine.) Recently, however, I ran into a problem with version 1.8.1 of the desktop client, running on a laptop with Xubuntu 15.10. Basically, every time I started the client it would ask me for my username, password, and folder list, as if I were configuring it for the first time. This happened when just logging in (when I have it set to start automatically), or if I killed it and restarted it. But when I tried to display the file owncloud.cfg, I got an Input/Output error. I could list the folders directory; this just contained a file with conf info for each of the folder I sync. On a hunch I deleted owncloud.cfg, and restarted the client. It asked for my login information again, and then I told it to skip the folder configuration. It worked, and even picked up the folders I had set up to sync (as those configuration files were readable). I’m not sure what caused this, but after doing this I can view the new owncloud.cfg file that was created. Hopefully this save someone some time. It’s a little aggrivating that I did have to poke around in the terminal, but not too bad – at least it’s possible. I’m not sure if this could be a bug in the client, but if this happens again I’ll reevaluate. 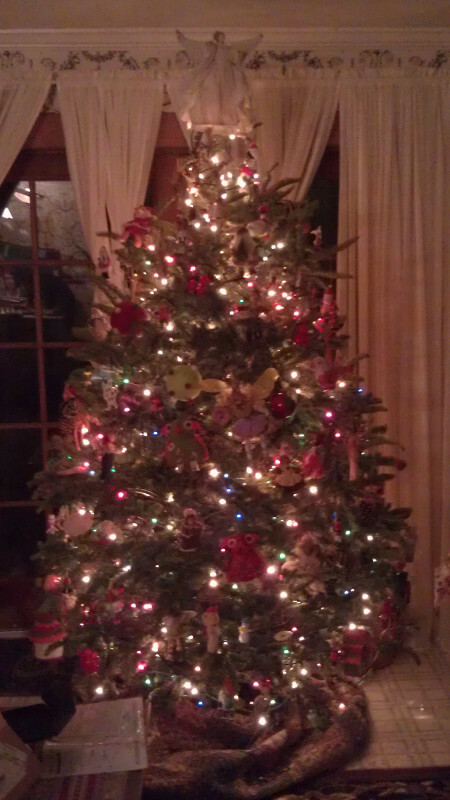 Merry Christmas, while it’s still 2014. 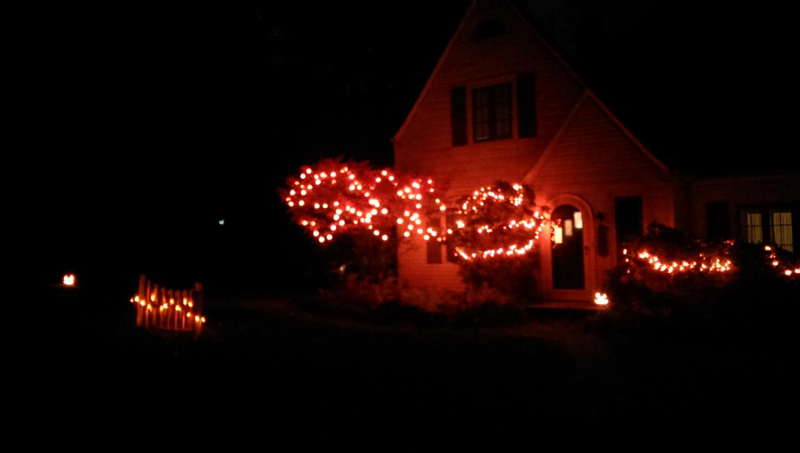 Author BenPosted on October 31, 2014 Categories UncategorizedLeave a comment on Happy Halloween! The meter is connected between the negative (black) battery post, and one of the legs of the 120 volt output, and is reading about 67 volts AC. This works between that post and either leg of the output, as well. Going between the two legs gives 117 volts, which is the output we want. Notice the ground symbol on the low-side of the H-bridge? That’s our problem – imagine that the MOSFET just above it (the lower left-hand one) is on, as is the one diagonal from it in the upper-right. The other two are off. 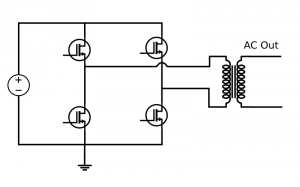 If we measured between the AC out leg from the left-hand side of the bridge to the ground node, we’d see 0 volts, because it’s the same node – the transistor shorted that leg to ground. But, milliseconds later (about 8.3 if we’re at the beginning of the cycle) the transistors switch – now, that same leg of the AC out is at the voltage of the DC source (could be battery voltage, or could be from a DC-DC converter), and that’s what we’d read on the meter. It would be in this state half the time, and with the meter set to AC voltage we’d read something like the 67 volts in the first picture. 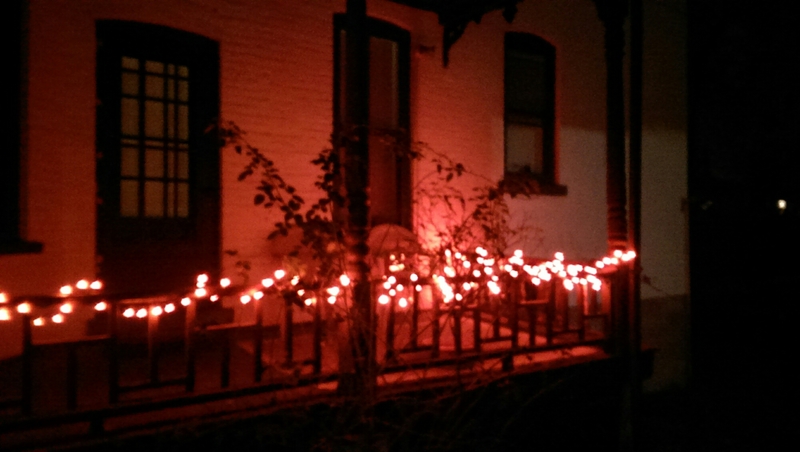 The AC output is floating with respect to the ground point. The problem, then, is if at any point in your AC wiring the ‘neutral’ conductor is tied to ground, and that ground is also tied to Battery-, you have a short-circuit path! This depends on the design of the inverter as far as whether or not it’s a pure short circuit (the DC source would have some impedance to it, so it might not necessarily be like a dead short on the battery), but it could still damage your inverter. Not to mention that having a voltage between Battery- and the AC neutral or ground would be a safety hazard. So, how much of a problem is this, really? Well, in the picture the inverter is running a laptop charger, which is encased in plastic and I think actually provides isolation between its input and the laptop. So, here I’m not worried about it. However, say you wanted to provide some backup power to your house in a power failure. It’s not uncommon for people with a generator to backfeed their circuit breaker panel (either with into a normal outlet with an aptly-named suicide cable or with a proper receptacle and transfer switch). So what if we did this with this inverter instead? In the US homes typically have the neutral and ground bonded together in the circuit breaker panel. Now, say you have a little system with some solar panels and a big battery to run the inverter, and you happen to have the negative side of the battery grounded on a watter pipe in your basement, or maybe even the ground wire in your house wiring… Even if you drive in a separate ground rod for the DC side, you’ll wind up with a current path, and a potential safety issue. 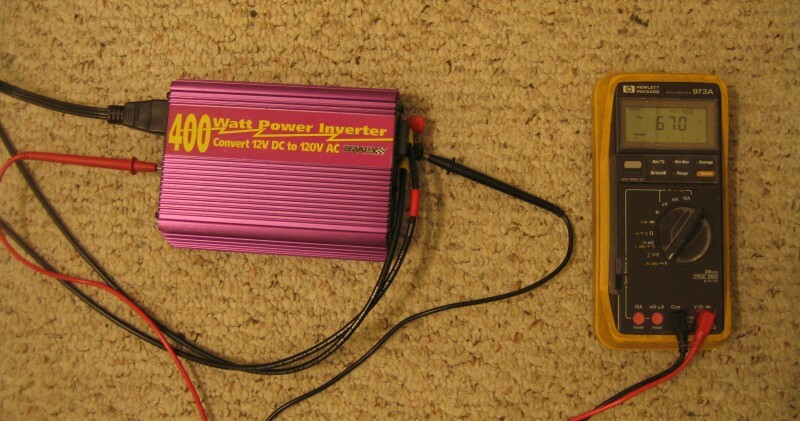 Now, a 400 watt inverter is a little small for backing up your whole house, but there are larger, cheapy inverters like this one that probably have a similar design. 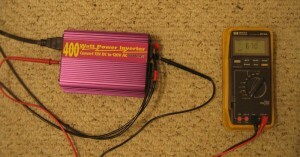 If you find a 2000-3000 watt inverter at your local hardware store for a few hundred dollars, this is probably the case. 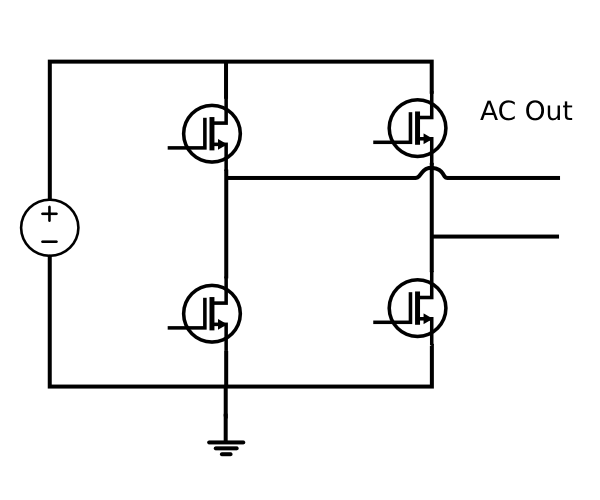 Notice that there’s a transformer on the output of the bridge – now the AC output is isolated from the DC side! So you can use the same ground on the DC and AC sides. There isn’t an electrical connection, there’s a magnetic one, so we just transfer the energy across. There is a small section where the AC is floating, but it can be safely enclosed in the inverter chassis, and insulated appropriately. 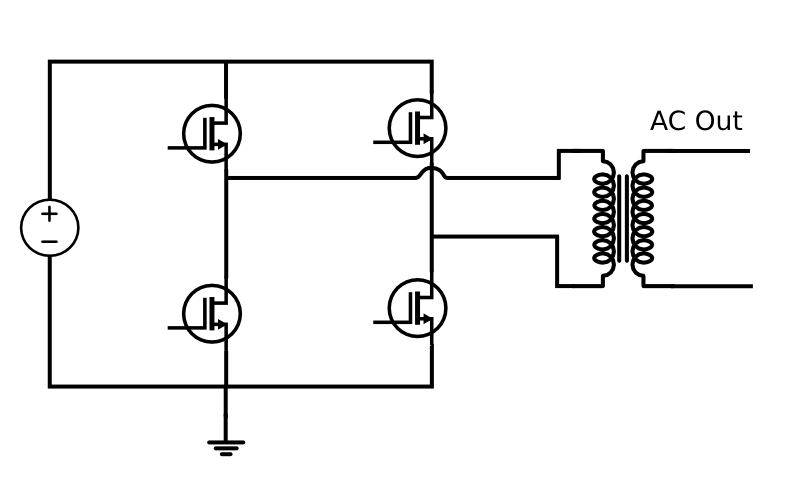 Of course, there are other solutions; the DC source could be fully isolated itself, and the low-side of the H-bridge could remain ungrounded. 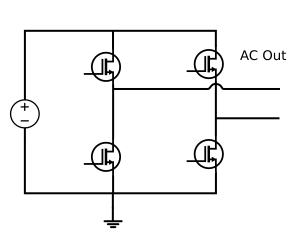 This way you could still reference the output to the inverter’s DC input safely. On another note, those working with renewable energy will tell you that building a solar power system just for the off chance your grid power is out for a few hours a few times a year isn’t very economical. This is true, but I imagine that there are people out there who will think of attaching a big, cheap inverter to their home’s wiring, which is why I threw this together. The moral of the story is, if you’re going to distribute the AC from your inverter in a more complex fashion than an extension cord and power strip, check for voltage between each AC leg and the negative DC input. If you’re looking at buying an inverter, see if you can go to the store and try this with a multimeter. Or, call the manufacturer, and see what they say about hardwiring it. If it’s designed to be wired into an electrical system, there’s a good chance they’ve thought of this problem. 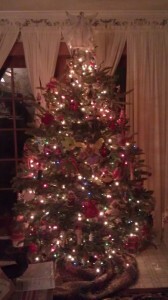 Yet another Christmas Tree pic.